Fly-tipping is a growing problem across the UK. Many lawbreakers will illegally use large areas like building sites as a dumping ground. For those in the construction industry, it can be time consuming, hazardous and costly, having to deal with someone else’s illegally disposed rubbish. The following guide, produced by agricultural insurance specialists Lycetts, outlines what processes are in place to deal with fly-tipping in the UK. It will also explore prevention methods you can implement on your site to deter fly-tippers. What is regarded as fly-tipping? Fly-tipping involves the illegal act of disposing of waste material on a land that is not licenced to receive it. Common items that fall under fly-tipping are bags of rubbish, furniture like beds and mattresses, garden waste, and tyres. Does fly-tipping happen a lot? The Daily Telegraph reported on fly-tipping after a freedom of information request by ITV, which revealed the extent of Britain’s fly-tipping problem. Keep Britain Tidy’s chief executive, Allison Ogden-Newton, went as far as to say that the crime has reached “crisis levels” throughout the country. Some parts of the UK have seen fly-tipping incidents rise by over a fifth year-on-year, according to The Daily Telegraph. For example, almost 40,000 reported incidents were recorded in the North London district of Haringey between November 2015 and December 2016, with more than 30,000 incidents also reported in Manchester over the same period. Even with some parts of the country seeing a reduction in the number of fly-tipping cases, the issue is not yet resolved. In Birmingham, for instance, the number of fly-tipping cases are down by 13 per cent between November 2015 and December 2016. However, the figure during this period was still recorded at 21,000 offences. Fly-tipping is a particular problem in Scotland, says James Cuthbertson, an account executive at Lycetts. Near to 61,000 fly-tipping incidents are recorded in this country every single year, Mr Cuthbertson has found. Efforts are in place to try and discourage fly-tipping. Figures from the BBC show 1,602 prosecutions were made across England for fly-tipping between 2016 and 2017. What’s more, 98 per cent of prosecutions made resulted in a conviction. During the same time period, councils across England served 56,000 fixed penalty notices with regard to cases of fly-tipping. What are the penalties for fly-tipping? Carrying a penalty of an unlimited fine and five years’ imprisonment, fly-tipping is marked as a serious crime. It is also important to note that those who permit fly-tipping to take place on their land or any land that they rent will also be committing a fly-tipping offence. What can I do if I am a victim of fly-tipping? You are responsible for clearing away any rubbish on your site, even if you are a victim of fly-tipping. Fly-tipped waste may be dangerous, so do be careful when dealing with it. Bags and drums should not be opened, and piles of soil should be a cause for alarm bells as the material could be contaminated or hiding dangerous material. Those in England and Wales should head to this GOV.UK page and report fly-tipping by first entering the postcode where the waste has been discovered. Those in Scotland should report fly-tipping waste by either filling in a simple online form on DumbDumpers.org or contacting Stopline directly by calling 0845 2 30 40 90. Those in Northern Ireland should head to gov.uk and find details for their local council, who will be able to advise on the waste disposal sites and recycling centres based nearby for the safe and legal recycling or disposal of unwanted items. After reporting the waste, secure it to prevent any unwanted interference or additions to it. There are measures to consider when the waste is being moved away as well. First and foremost, do not take the waste to a licensed site yourself unless you’re registered as a waste carrier. If hazardous waste has been identified, it should only be carried and then disposed of by someone who is licensed to deal with hazardous waste. If a third party is required to deal with the waste for you, make sure they give you the required documentation. It should include details about the waste and those who are taking it away. Keep all information about clearance and disposal costs safe, as these can be recovered in the event a successful prosecution is made against the crime committed. “In the event you wake one morning to find the midnight cowboys have paid you a visit, if the problem is severe, it is worth consulting with your insurance broker,” Mr Cuthbertson says. If you spot someone actively fly-tipping on your site, your own safety is priority. As the practice is illegal, people are unlikely to take kindly to their crime being observed. Do not confront the guilty parties, but instead immediately call 999 and then make a note the number of people involved, descriptions of their appearances, details about the waste being fly-tipped and information about any vehicles used — this includes the makes of the vehicles, their colours and their registration numbers if you can make it out. Many companies would call a skip hire company like Mackers Total Recycling to help remove rubbish that has been fly-tipped or dumped. What can I do to prevent fly-tipping on my site? There are steps you can take to reduce the risk of fly-tippers visiting you. Making sure any gates are closed and locked when not being used will secure your site from fly-tippers. Strategically placing physical barriers around the perimeter can also make it difficult for fly-tipper’s vehicles to get through. The risk of being caught is also a very effective deterrent. Therefore, work on improving visibility all around your property and its land, make sure high-quality exterior lighting is installed and in working condition, and set up CCTV cameras and appropriate signs alerting people of the technology’s presence. Alongside homes, which have halved in size when compared to those built in 1920, between 1983 and 2013 British gardens have shrunk from 168 metres squared to 163.2 metres squared. Additionally, more than two million homes in the UK are without a garden at all according to figures released in 2010. The same study noted that by 2020, around 10.5% of homes would likely not have a garden. Considering research that suggests children who don’t have access to a garden are 38% more likely to struggle with obesity, this is a bleak forecast. Plant pots: Now made from plastic or biodegradable material, where they used to be made from clay. Fertiliser: It used to be that fertiliser was entirely organic. However, chemicals have now been developed to serve as fertiliser – although many gardeners prefer organics. Lawn mowers: Grass cutting used to be a manual endeavour. Early machinery was developed in the 1900s which saw early versions of cylinder mowers powered by pushing. Now, electric-powered motors mean gardens are far easier to maintain. Materials: Gardening still uses the basics: stone, clay, timber and soil. Now, however, we use plastic, concrete and stainless steel – which was invented in 1913. The approach to gardening has changed a lot over the years. During WW2, gardens became areas for growing food to supplement rationing, but also an area of refuge for those who’d build their own bomb shelters. In the 1950s, gardeners shrugged this sensibility off and focus shifted towards ornamentation and decoration, placing more attention on manicured lawns and neatly trimmed shrubs. Garden Centres began cropping up in the late 50s and early 60s, with the first in the UK appearing in Ferndown, Dorset in 1955. This widespread availability of plants meant heathers, conifers and bedding plants became popular. The 70s saw another change, going back to the concept of gardens being used for self- sufficiency. Colour TV’s invention also saw the widespread airing of gardening programmes. 80s gardening became akin to what we are used to today, with gardens for recreation. BBQs and conservatories grew in popularity. By the 90s, this movement became more about the ‘makeover’ – with many people installing timber decking as a fast, affordable way to create a living space in their gardens. The digital revolution of the 2000s once again changed gardening. Now, information about growing and cultivating your own plants is everywhere, accessible through mobiles, desktops and tablets. A renewed focus on climate change and healthy eating has also meant more people are aiming to create sustainable gardens with minimal harm to the environment, using recycled materials in everything from plant pots to fencing. We have more information than ever before, but less space to try it out ourselves. For some, this means studying guides online and creating their own DIY fruit and vegetable gardens. For others, it means creating as much living space as they can in their shrinking gardens. Once you have your new banners and printed products for marketing, you have to consider where best to place them. Put them up in an ineffective location and you won’t see a good return on your investment! We’ve teamed up with Where The Trade Buys, a UK-based print company who offers a variety of banners such as roll up banners, to take a look at the best spots to display your printed adverts. People won’t spend forever looking for your building and may become frustrated if they cannot access the health services they need. This is highlighted by the fact employees in the UK are working more overtime than ever before with 60% of those asked stating that they don’t have a good work-life balance, according to a study published in The Independent last year. Therefore, take a moment to consider your location. Are you easy to find? Even if you’re slightly off the high street, tucked away around a sharp corner or sandwiched between two larger buildings; you could run the risk of clients giving up on finding you. By placing your roll up banner in a location that signposts your building, you can direct your customers, as well as advertise your brand to the general public. Use bold fonts and colours to highlight your address and tell people which other shops you’re next to or opposite so they can quickly work out where you are. If you’re thinking about placing these outdoors, make sure you opt for a quality PVC or vinyl banner to make sure your ad can endure the weather for maximum return on your spend. Your brand doesn’t end at the front door. The sleek dimensions of a roll up banner will allow it to stand conspicuously in the corner of your foyer or next to your reception desk, while not overpowering the room and making it look cluttered. Studies show that many of us form an impression of something as quickly as one tenth of a second, which means you don’t have someone’s attention for long! Designing an eye-catching roll up banner that not only features complementary colours — perhaps matching your reception décor — pleasant fonts and nice imagery, but also highlights interesting information about your company might be another helpful marketing factor to convert sales from new customers and boost brand loyalty among current clients. Are you still a family-run company? Have you recently added another line of products to your range? Just reached five or ten years in business? Achievements like these matter to people who walk through your door, and the beauty of a roll up banner is that you have the space to advertise snippets of success stories — unlike with a small leaflet, for example. According to an article by the Economist, the immediate entryway to your building is the ‘decompression zone’. This is because customers need to momentarily ‘slow down’ to assess their new surroundings and assess which products are on offer. As a result, this is a great place for promotional material. Even if you don’t have a reception area, you can simply place your roll up banner just inside the entrance for the same powerful marketing affect — another way to boost ROI. Eventbrite put the UK events industry as worth a staggering £42.3 billion, with 1.3 million business events held every year. Corporate hospitality accounts for around £1.2 billion, while exhibitions comprise £11 billion and conferences make up the lion’s share at £19.9 billion! But, how do you maximise your exposure when you’re surrounded by so many other brands? Clearly, this industry is big business and you don’t want your company to get left behind if you aren’t active in trade shows and corporate gatherings. Banners and printed media can help leave an imprint on people’s minds much better than digital alternatives. If you want to stand out against your competitors at a major recruitment exhibition and create that bond to entice people to come over, why not design an attractive, descriptive roll up banner and place it next to your stand? According to a study carried out in the US, participants that viewed print media showed a greater emotional response for it and were able to recall its details better than they could for digital ads. If it’s eye-catching enough, it will draw potential partners and employees to your table where you can begin discussing the key details of your business. With a printed banner, your audience is much more likely to remember you after the show’s end than if you had no banner displayed at all. Your window (if you have one) is a great place to get information out to your clients and customers. 80% of people admit they are ‘promotion sensitive’, showing a tendency to notice promotions and notices in windows. Highlighting a special discount on your roll up banner placed in your store window will give your offer excellent visibility to help bring foot traffic in-store. Also, research shows that discounts can make it less probable that people will then compare your range with your competitors’! Remember to use contrasting colours and large text to highlight your offer on your banner. Linda Cahan, store design and display consultant in an article published in Entrepreneur: “Each window should tell a story”. If you have floor-length windows, simply angle your roll up banner so it is clearly visible to people and cars coming from all directions. Or, use a platform to give your advert height so it can be easily seen. A strong and alluring window display can be the difference between a potential customer stepping inside your building and walking or driving by it. Are you making the most of this key piece of promotional space? Have you been shortlisted or won an award? There are countless ceremonies for every industry taking place across the UK throughout the year. An essential to good marketing Is spotting how you can hallmark your brand when you’re surrounded by competitors at a special event? Stay in the focus of people’s minds with a printed advert displaying your achievement, which as previously mentioned, tends to be more effective than digital adverts. A Canadian study sound that three quarters of people could remember a brand after viewing it via a print media ad. Conversely, only two-fifths were able to recall the company after seeing it on a digital platform. To boost ROI, create a well-structured roll up banner or two that can act as backdrops to any interviews you hold or videos/photos you take when your staff are at the awards event. Colour, design, content, and imagery are important characteristics — only use complementary colours, clear layouts, insightful text, and high-quality resolutions. Hashtags, contact information and your brand logo are also essentials. Then, share your snaps or videos on social media to spread brand awareness! Be aware that not every event is suitable for promotional material, such as red-carpet-style award ceremonies. However, some are very business-based and can last all day before the awards section takes place in the evening. In which case, use this time to promote your brand on social media and YouTube. A creative, attention-grabbing roll up banner stamped with your brand logo and key information you want customers or prospective employees to know will work wonders to promote what you do. There are so many places a roll-up banner can be an asset to you and your ROI. Bear these key tips in mind to maximise your ROI! Some industries are notorious for putting their workers at risk. In construction, for instance, news of workers falling from scaffolds, getting crushed by lorries, or cutting, burning or electrocuting themselves rarely make news headlines. According to a study by health and safety consultant Arinite, 1.36 in every 100,000 construction workers died in the UK in 2017 due to a work accident. Cases of dangerous working conditions resulting in injuries, accidents and huge consequent penalty fines are widespread on the HSE. Infamous incidents, like Alton Towers, bring awareness to slack health and safety precautions and their tragic consequences. However, not every danger in the workplace is as well-known and taken care of as slips, traps and plugged-in chain-saws. Last year, the HSE recorded 137 fatal injuries to workers across all industries in total. The number of lung disease deaths linked to past exposure at work is estimated to be about 12,000 per year. Long-term health issues from exposure to dangerous substances frequently include asthma, leukaemia or cancer – and workers don’t notice the threat until it is too late. Indeed, compared to a slip, the source of danger can be much more difficult to detect. Yet, the UK is facing an issue that seems to have been neglected for far too long. In Europe, more than 38% of all enterprises reported using potentially dangerous chemicals in their workplace. To make sure that businesses prioritise their employee’s health and safety, protecting them against occupational diseases, the European Agency for Safety and Health at Work has created a new campaign, called Healthy Workplaces Manage Dangerous Substances 2018-19. They are asking for an improved prevention culture to decrease the number of workplace-related illnesses and health risks on both the manufacturers and the consumers’ side. Many workers don’t realise the dangers they are facing in the workplace every day. At first sight, substances like paint, glue or detergent seem slightly unpleasant to work with at most, but don’t strike as potentially life-threatening chemicals. However, long-term exposure can turn those seemingly harmless products potent disease triggers. Fine dust, like flour, can trigger asthma when inhaled on a regular basis. Wet cement can lead to chemical burns. Damp vegetable or fruit might cause fungus infections or dermatitis. Pesticides increase the risk of developing leukaemia. And that’s just a brief glimpse into a long list of products many workers are dealing with on a regular basis. Often, low awareness is at the heart of the problem. If a worker is not aware they are working with a harmful substance, sensible handling is practically impossible. Everyone potentially exposed to chemicals or biological substances needs to be trained and informed thoroughly. Only then can risks be handled, reduced and eliminated. But raising awareness does not just apply to workers – it needs to involve everyone in the work process, from manual labour worker to manager, to the consumer. Chemicals like asbestos can cause health problems even decades after initially used as they remain in our daily lives as part of our houses, workplaces and public spaces. Helping companies understand that using these substances may cause severe illnesses to their staff and also outsiders further down the line, is crucial when trying to establish a healthy business approach. Internally, every health and safety plan starts with a risk assessment. But unfortunately, sometimes an audit doesn’t fully uncover all safety hazards. Only an experienced, competent consultant will be able to identify those often hard-to-spot dangers – like invisible, but toxic, gases. An assessment should involve identifying and erasing risks by making sure that every employee knows how to handle potentially dangerous situations. Also, since working environments change, new people get hired, and memories fade, regular health and safety training is necessary. Ideally, a safety officer should check for unidentified hazards and educate workers, managers, and employers every six months. In terms of health and safety laws, a good grasp of legislation is needed to understand where employer’s legal responsibilities lie and how to ensure the business is compliant. Even with a comprehensive health and safety policy written down, realising those guidelines in practice is a completely different story. Safety instructions printed on the wall do not guarantee people reading and following them. Access to safety gear and protective clothing does not mean workers will use it. Monitoring staff and establishing the benefits of sticking to the safety policy is very important. People don’t like to blindly follow rules, so educating them about dangers that could potentially affect them personally, will help with ensuring they are taking the advice to heart. If any instructions or training sessions leave behind unanswered questions or uncertainty with the staff, management needs to follow up and make sure those questions are answered right away. Companies need to start working towards a healthy, sustainable future right now, prioritising their workers’ well-being. It is not surprising that manual jobs are becoming less attractive to young job-seekers as other industries attract with much better working conditions. But manual work doesn’t have to be dirty and dangerous – it can be a rewarding and fruitful environment to work in when employers are setting the right frame for it. The first large build-to-rent project in Nottingham, designed by architects maber and built by Winvic Construction for the Cassidy Group and Cording Real Estate Group is now on site. The 350-apartment Saffron Court project is already proving a catalyst for the regeneration of the City’s south side with a neighbouring development now also underway. Saffron Court is being developed by the Cassidy Group and Cording Real Estate Group on the former Hicking Pentecost site near London Road. On this project maber are is providing architecture and landscape design services, and assisted the developer to secure planning consent for a revised scheme layout through a Section 73 agreement, which was granted by the city council in January this year. The practice are also working on comparable build to rent projects for clients in the capital. In common with the new generation of build-to-rent developments, the scheme includes a host of facilities to serve the development’s mix of studio and two-bedroom apartments. These range from under-croft parking to a communal residents’ lounge on the ground floor and two large, raised courtyard and landscaped terraces at the first floor level. A central reception, with concierge service as well as post and grocery storage, will be provided as well as a gym and a meeting space. The apartments have private balconies and terraces with the larger apartments offering walk-through wardrobes between two double bedrooms and en suite bathrooms. Ground floor units have direct access to the street, breathing new life into the local streetscape. The scheme is due to complete in June next year. For years, tradespeople have been tarnished with the reputation for prioritising football over work. Many members of the public see them as being a bit too eager to down tools and head to the nearest big screen. However, recent research among tradespeople busts this myth. The UK’s leading online trade supplier, IronmongeryDirect, has run a series of polls to find out more about tradespeople’s attitude to work during the World Cup. Many participants, including builders, carpenters and joiners, are currently planning when and where they will be watching their team – but outside of work. According to a poll of more than 1,000 IronmongeryDirect customers, over 75% of tradespeople claimed they would never consider skipping work to watch their team. Employers are recognising that the World Cup is important to many of their staff. Many responded to the polls saying they would be more than happy to be flexible by offering them time off. One respondent stated: “As the boss, I always give my team the time off. It also saves them giving me the daft excuses!”. The research also revealed ongoing optimism among tradespeople, with more than half believing England will make it to the Quarter Finals. Also, half of those polled (49%) said they would give up alcohol for good to see England win the tournament. Global ecological awareness is an increasing priority in construction – both for the construction companies, and the homeowners and businesses buying such properties. Of course, eco-approaches, sustainability and the use of exciting and innovative recycled (and recyclable) materials can only be a good thing when it comes to building necessary homes, business and public service premises. Yet there’s another piece of good news: eco-construction is getting competitive. There are now prestigious awards, such as the Global Good Awards UK’s Building Sustainably Award, which rewards and highlights those building projects which showcase innovation in eco-construction. Not only does winning such awards offer significant kudos for construction companies, earning them recognition and respect for their achievements and methods, but also the healthy competition generated inspires continued growth and innovation in this important area of construction. Since its completion in 2015, this highly eco straw-clad building has won many awards including several from the Royal Institute of British Architects (RIBA). The building’s eco-credentials include a real focus on sustainable materials, which incorporate straw cladding to the exterior of the building. Sought to replace recently demolished local landmarks, the Tinsley Towers, the construction of this new power plant needed not only to be robust in terms of its function and its eco-construction credentials, but also sustainable in terms of its heritage symbol’s contribution to the local landscape. This magnificent 10-storey high building in London is not only winning awards, but also setting new standards when it comes to sustainable construction and efficiency for office buildings. LED lighting has been installed throughout, using 40% less energy than the fluorescent lighting commonly found in office buildings. Carbon emissions at 65% less than similar sized buildings. Significant levels of self-sufficiency by providing 30% of its own electricity via photovoltaic panels across the roof. Recycled beer can ventilation snouts. Wool carpeting and textiles made from Herdwick sheep fleece, from the Trust’s own flocks. 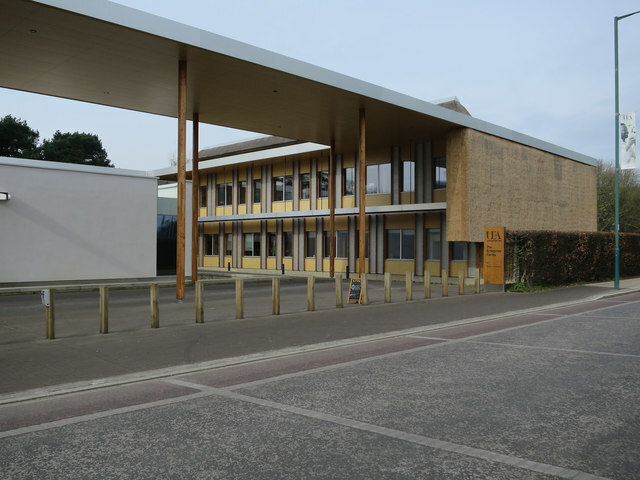 It’s back to Norfolk again for this eco-scheme which has been up and running for approximately a decade now and was also, at the time of construction, considered for the Royal Institute of Chartered Surveyors (RICS) Sustainability Award. But even today, the development continues to draw attention from its focus on going ‘back to the roots’ of sustainability, particularly in the context of the current housing crisis. The complex of four bungalows is constructed so that the majority of the accommodation lies under ground, effectively using the earth and layers of plants on top as insulation. In this way, the building is naturally protected from all extremes of weather and temperature, being both energy efficient and freeze proof, so much so that no conventional heating systems are required. Since being built, the properties have also proved low maintenance and to ‘heal’ the signs of their own construction, now blending beautifully with the natural environment and providing welcome habitat for both human occupants and wildlife on the roof. Such developments are now moving back into the limelight as the latest generation of eco-builders (and possibly housing ministers) consider the debate between green space and much-needed housing: by providing shelter for living or working, with minimal impact, then these buildings can really stand out just by blending in. Finally, as with any construction site, eco-construction also requires barrier products for safety and security. Talk to SafeSite Facilities if you’re specifically looking for construction site products which are also designed with recycling and sustainability in mind.